Sentera's Omni Agriculture Drone is released! This Ag Drone is a high performance UAV capable of offering comprehensive solutions for agricultural care. The versatile Omni agriculture drone is paired with a Sentera Double 4K sensor, taking crop scouting to the next level. 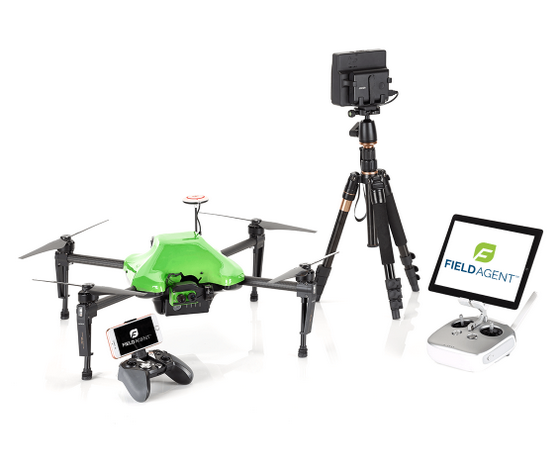 This winning combination allows farmers or professional to easily capture various distinct crop health data measurements in a single flight: thermal, LiveNDVI™ video capability, rapid image collection, normalized difference vegetation index (NDVI) and high-resolution RGB — providing farmers with precise crop-health imagery. The Sentera Omni quadcopter drone is priced $12,999. This is the best agricultural drone you can get near you, in a price range accessible to everyone. Capable to collect live streaming NDVI video from obscure angles — while your drone is still in the air, the Omni agriculture drone and gimbaled Double 4K Sensor system delivers crop views in macro and micro data and provides the user with true distortion-free imagery. Integral to the Omni UAV’s versatility is pairing it with the Sentera Double 4K Sensor. The accompanying Double 4K sensor is the leading-edge data-processing technology, smallest, lightest dual sensor available today. Capturing 12MP high-resolution images with the narrow-angle lens, the Double 4K allows expedited delivery of precise NDVI crop-health imagery, with amazing, precise clarity — like nothing else on the market. The ability to detect and diagnose quickly and accurately pinpoint plants that appear to be sick is critical. With this knowledge, farmers can quickly ground-truth the area and take the appropriate action before a problem potentially gets worse. 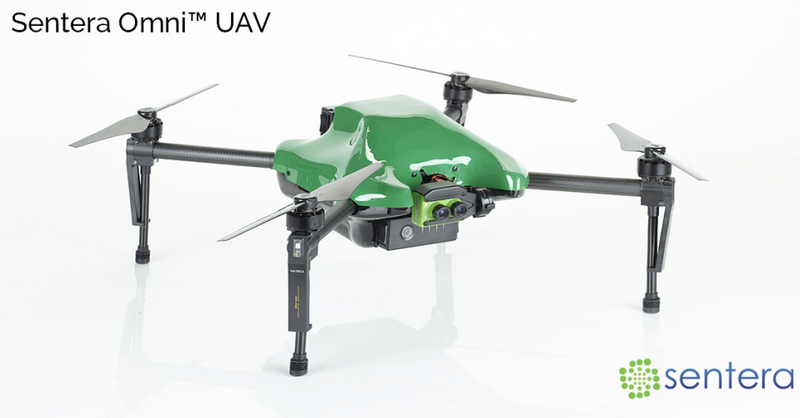 The Omni drone naturally partners with the DJI XT thermal sensor is ideal for the irrigated crops. A thermal measurement can quickly show where areas within a field are under- or over-irrigated or where equipment is malfunctioning. The added ability to capture thermal data allows professionals to further evaluate plant health and practices as reflected through plant and soil temperatures. Thermal sensors of Sentera Omni are also useful when farmers need to locate or confirm the installation of subsurface drainage: Historically, the most common way to detect pre-installed drain tile was to probe and dig, which was extremely inefficient and time-consuming. Now, through thermal technology, farmers can identify cooler areas of a field which would be an indication of the presence of drain tile. Farmers then can focus their efforts on that area. Weighing only eight pounds, the versatile and easy-to-fly Omni is compatible with a variety sensors — carrying each for up to 25 minutes of flight. Payload compatibility includes Sentera Double 4K, DJI Zenmuse X3, Z3, XT, and new Z30 sensors. Sentera’s AgVault™ and OnTop™ Open Software Platforms manage the multitude of images and data collected during flight and allow near-real-time reading and analysis of the data, including working with other data sources via APIs. Data is easily cataloged and stored for future analysis. Pricing information can be collected in several ways to help you get the reference price of Sentera Omni Ag Drone and determine the best price product. Overseas distributors and agents of similar products of equivalent quality are one source. Also, traveling to the country where products will be sold provides an excellent opportunity to gather pricing information. Interested in purchasing Sentera's Omni Ag Drone? Contact Sentera today to learn how! There's a lot of work needed to make your rural area a reality. A new, helpful book called "Your Buyer's Guide" will assist you in successfully managing your farm land. We offer this price and spec collection of Sentera's Omni Ag Drone to users so they can plug in our pricing without needing to contact us for a quote on every Ag Drone. 0 Response to "Sentera Omni Agriculture Drone for Sale"